If you are looking for one thing to slip easily into your daily routine that can have far reaching benefits from mitigating the pain of minor aches and pains to decreasing your risk of major diseases such as Alzheimer’s disease, then practicing mindfulness takes the cake. By simply taking the time to focus on being as in the moment as possible you can cause real, positive changes to your brain as well as improve your mental state as effectively as if you had taken pills for the privilege. Intrigued? This book has the answers you seek! Achieving a state of mindfulness is done by simply focusing on the sensations your senses are experiencing every second, sensations that mental filters naturally tune out in favor of louder external stimuli. To do so, all you need to do is take deep, controlled breaths and focus on doing so to the exclusion of all else. While it sounds simple, it is quite difficult in practice which is why you will find everything you need to practice mindfulness in literally any situation. 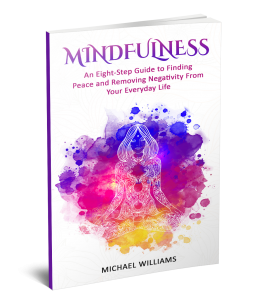 Inside you will find numerous exercises designed to teach you about proper breathing, proper mindsets and numerous ways to make the most mindfulness out of even the worst situations. One quick and easy breathing exercise designed to give you a quick and effective boost of energy. The secret to acknowledging thoughts without interacting with them. How to get all of the effects of a mindfulness session in a single minute. Several ways to make your workplace a haven of meditation. Regularly practicing mindfulness has been shown to have real, practical benefits across all facets of life and it can be done while you are commuting to work, having your morning coffee, or even while you are online viewing social media. There is literally no excuse to give it a try. What are you waiting for? Get this book today!